Ireland wing Tommy Bowe will miss this season’s RBS Six Nations Championship due to a knee injury he suffered during the World Cup quarter-final defeat against Argentina nine days ago. Ulster head coach, Neil Doak, confirmed on Tuesday that he will be sidelined for at least six months. “Tommy sustained posterior cruciate ligament and meniscal injuries to his right knee during the Rugby World Cup quarter-final against Argentina,” Doak said. 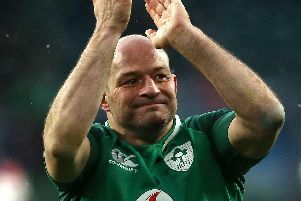 The 31-year-old British Lion has won 67 Irish caps and scored 30 Test tries. Ulster also provided updates on two more of their injured Ireland internationals - lock Iain Henderson (hand) and centre Jared Payne (foot) - who were both hurt during the World Cup. “Iain will undergo surgery later today to stabilise a joint in his hand, which was also injured in the Argentina fixture. “He will be of action for approximately six weeks,” Ulster added. “Jared’s fractured foot was stabilised through successful surgery.